Two explosions at Brussels Airport and another blast at a metro station in the city has forced the closure of the entire public transport network. At least 13 people died and 35 were injured, Belgium’s prosecutor said. At least one metro station was also hit, early reports indicate (Photo: Alexander Rentsch). The explosions hit the departure hall at Zaventem airport, on the outskirts of the city. The cause of the explosions is not yet known. Officials could not confirm whether the explosions were terrorist attacks. The airport has been evacuated and closed, flights have been cancelled and train services to the airport suspended. Another blast hit the Maelbeek metro station in the EU district in central Brussels, where journalists on the scene reported at least 15 injured people. The threat alert has been raised to the highest, level four, throughout Belgium. All public transport has also been shut down in the capital city. Brussels sprouts may be the first thing that comes in mind, when one thinks of Brussels. Further if we rummage through last one year of news, trying to find mentions of this beautiful city, most of them would deem Brussels diminutive in terms of its international importance, for its association with EU. Though Brussels headquarters NATO as well, EU brought Brussels in news in recent past, precisely because it is ‘Capital of European Union’ and since EU(and their Economic structure) was written off umpteen times in the run up to probable Greek default. (Around July, if you remember). However as the caption suggests, Brussels is in News again for wrong reasons now. But I would substitute wrong above with different. Association of this city with (perpetrators of) terror is not wrong. If you allow a Jihadi network to flourish in your city with impunity there is nothing wrong when the monster shows its true face. It is inevitable; and nature of current mentions is of course different, but previously infrequent because in the past Brussels hardly made headlines for this reason. To keep you updated, it is suspected that at least one of the attackers came from Brussels (Molenbeek area to be precise) and security agencies believe the deadly Paris attack plan might have been hatched in the area, which has been a hotbed of terrorism for quite long. a) Belgium has the highest proportion of extremists fighting for ISIS based on its population. b) Ratio being 1 per 1260 who have been involved in Jihad in Syria and Iraq. Assuming same ratio exists in India, 1,36,000 Muslims would be leaving to fight for ISIS. Fortunately, this has not happened. Nor the scaling makes statistical sense. I just extrapolated the numbers to give readers an idea (and not scare) about quantum of the ratio. (a)Erstwhile Mayor of the Molenbeek area, who held the position for 18 long years allowed not just influx(of African migrants) but fought for their assimilation, normalisation into the country. His opponents allege this was just for votes. The current Mayor accepts the problem of rampant radicalisation in the area but refuses to call it ‘a nest of terror’, despite the obvious fact that almost all of local terror attacks were related to that area, and Police have been continuously hunting suspects highly localised in the area. (b)One of the ministers of 19 years claimed radicalisation was because ‘the region did not allow Muslim youth to thrive’, almost defending the radical elements. (c)A CNN report not just mentions ‘unemployment’ and ‘radicalisation’ in same sentence multiple times(even when quoting their Mayor), somehow trying to put blame on Belgian society. 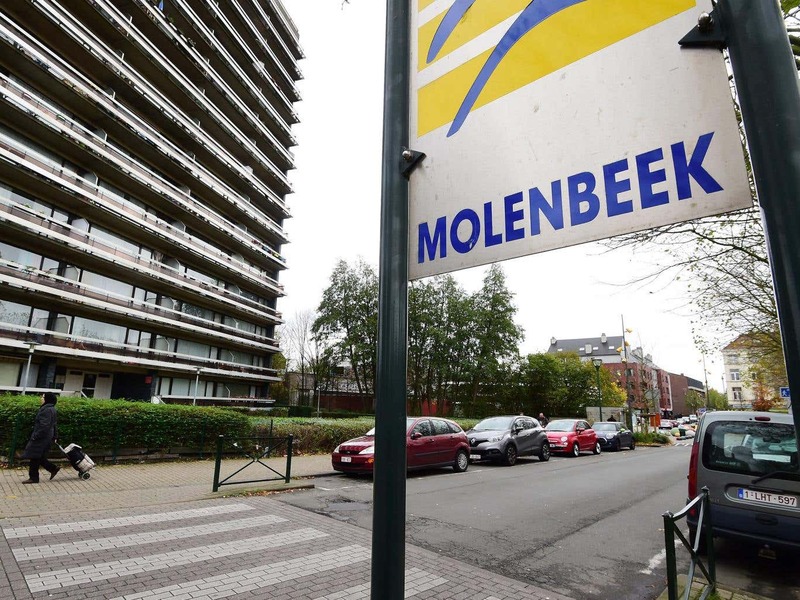 (d) Belgian Interior minister had said before Paris attacks ‘We don’t have control of situation in Molenbeek’. May we know why, Sir? Are we not talking about a city where officials of most powerful Armed forces and biggest conglomerate of Commerce meet? Why is it that a ‘black – hole in Europe’ existed right under your nose, in your back yard and you never noticed! Or is it the case that you noticed but chose to remain silent for obvious reasons? Isn’t it incongruous, that EU-NATO-Headquarters, and a terror hole co-existed? Here, moot question being, how could terror monster infest, grow, and flourish right in the city which boasts of NATO and EU headquarters. Can it because of Left-Liberal policies, proponents of which are often compared with Ostriches, always in denial mode until reality strikes? A planned brutal attack by Islamists against disbelievers would naturally evoke anti-Muslim sentiments. Fortunately that has not happened . French are still almost as warm towards Muslims as they were in past. Though there are concerns about growing Muslim population in the country, majority population has never seen the rise as a threat, and continue to do so. Some say – Muslims are divided into two parts – Extremists who want to behead disbelievers and Moderates – who want Extremists to behead disbelievers. Is the narrative true? – No. We do have a Muslim majority at least in India which has kept away from Terrorism, in a direct and conspicuous way. Pew research showed almost same warmth about Muslims in French population, even after attacks. Pew research again, which pits 9 positives against 28 negatives, for opinionated people. Pew research again, statistics on religious-demographics growth expected in future. Then, there are popular Muslim haters (I won’t call them Islamophobes), like Pamela Geller whose every utterance reeks of abhorrence towards Muslims. Is all she says makes sense? NO. She picks parts of statistics which demonise Muslims, quintessential of the way Indian Leftist media does to demonise Right wingers. A famous blog on internet provides ‘data’ and claims ‘pattern’ based on Islamic population, on how they are going to conquer the world and wipe everything Non-Muslim. Here in India, some fringe Hindu elements would want you to believe Muslims are going to take over our great nation after (and if) they reach 40-50th percent in population. So, shouldn’t we ignore all that is scary, said and written about dynamics of Muslim demographics? Because, ‘Absence of Evidence’ is NOT ‘Evidence of Absence’. Do we have historic data (even adjusted to modern times) to prove Civilisations/Religious Communities are going to live in peace Always? NO. Weren’t Kashmiri Pundits, legitimate inhabitants of the valley kicked out, in a spate of violence which was not just gory, but also paralleled ethnic cleansing! And that too, by a majority most of who converted a 4-5 centuries back. Didn’t we see an inexplicable rise in Muslim population across districts in India’s North-East which is contiguous to Bangladesh! And ethnic rife too, ensued following the influx of illegal migrants. Has the Left-Liberal approach been successful in Belgium? Did it integrate Muslim minority with majority? No. Had it been the case we would not have had a ‘radicalized’ area which is a euphemism for ‘Muslim’ area. So we have at least one case where despite having a ‘egalitarian, leftist’ political landscape , one of the communities, here Muslims, minority in numbers, failed-and refused- to assimilate itself with majority. Is it possible to live in peace, without much if-not-any friction between Muslim and Non Muslim world (or that between any two communities)? Yes, Entirely. Or so I believe. Is it Possible that Islam will, inevitably ‘conquer’ the world? Yes. There exists a non-zero (Bayesian) probability. And the probability is not insignificant given a few statistics . As long as officials like above, keep citing reasons linking unemployment with radicalisation, and as reasons of pushing terror, we would be living in a denial mode. Isn’t the recent spate of ‘raids’ French and Belgian Police are doing, as we discuss, a reactionary attitude analogous to an Ostrich finally pulling his head out of illusory sand and trying to defend itself. Talking of solutions; containing ISIS with air-strikes may be just like security checks at Delhi Metro stations- giving us a false sense of security, and preventive, reparative action where exists none of it. – Should all Indians be forcibly brought under Hindutva? – Is it right to believe Non-Muslims would go to hell? – Is it right to believe Islam is the greatest religion? Is it even right to discuss superiority of one religion over another, now more than 40 years after we landed on moon? To sum it up, it feels really puzzling; to interpret the times we are living in. Yesterday, on one hand, Richard Dawkins shared a post, with exuberance, that a giant leap, ( a deviation than a previously assumed behaviour of qubit entanglement), has been experimentally determined in field of Quantum Computing; which means in years to come, Computational power will accentuate, exponentially, revolutionizing the way we compute. And today, in another interaction on social media, I was asked, condescendingly, ’But Do you guys even believe in One God’? Bhartiya Janata Party couldn’t grab Aiyar and Khurshid by their necks. What a loss? Mechanical Engineer by degree. Worked as a Futures Trader and now working in Banking Analytics. Avid Daydreamer. Root cause analyst.